Editor's Note: When President Obama spoke in Cuba on Monday, he hailed it as "a new day" with the island nation. U.S. dairy exporters may be wondering if Cuba could also become a new market. With relations already thawing a year ago, Vikki Nicholson, the U.S. Dairy Council's senior vice president, global marketing, took a fact-finding mission to Cuba to explore possibilities. In light of the president's visit to Cuba this week, we are republishing Nicholson's report. Our cab driver was visibly excited as he rolled down his window. It was the first of many positive receptions we received on the March 1-4 mission. Cuba and its 11.3 million population are eager for U.S. tourism and investment. The country wants to buy from and sell to the United States. By all accounts, U.S. citizens would flock to the island if allowed, and the U.S. agriculture community (and U.S. industry in general) covets the chance to do business there. President Obama’s new policy of engagement announced less than four months earlier has initiated a process that might make it a reality. The move to normalize relations does not end the 50-plus-year U.S. embargo on Cuba, but it has started the ball rolling to ease trade, travel and business sanctions, remove Cuba from the State Department’s list of state sponsors of terrorism and reopen the U.S. embassy on the island. These are all welcome developments that bode well for the Cuban economy and consumption—and ultimately U.S. dairy suppliers. The USACC mission confirmed the market potential, but it also confirmed that these are only the first steps. Here’s what you need to know about the changing political climate and the island’s food and dairy sector. It wants to diversify its economy and improve its infrastructure. In a measured venture into free markets, the government passed a new foreign investment law in 2014 that encourages joint ventures between Cuban and non-Cuban companies in select fields, including food and dairy. Although Alimport, Cuba’s government purchasing agency, remains the main buyer of imports, the law no longer mandates Alimport as the only legal buyer. 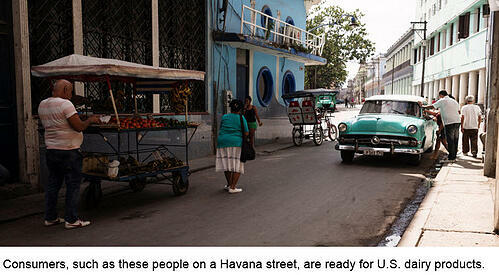 Some view this as Cuba’s first move to create a system of importers and brokers—unknown since before Communism. The Raul Castro government hopes the law will lay the groundwork for 5.7 percent annual GDP growth. Its reliance on 1950s era cars is well known, but ports, roads, rails, utilities and the nation’s food manufacturing and distribution network are old and in poor shape, which not only complicates export logistics but also stunts economic development and consumer income growth. Cuba plans to turn the port of Mariel, 40 miles west of Havana, into an agricultural import and food-processing hub, but much of the project is still in the development stage. Its domestic dairy industry is underdeveloped. Most farms own a handful of cows, per-cow productivity is extremely low, and forage is inadequate and costly. The nation currently imports 50,000-100,000 tons of milk powder annually, primarily from New Zealand, South America and Poland. U.S. dairy exports to Cuba from 2000-2014 totaled $109 million, varying annually from zero to a high of $30.3 million. Only about 10 of the nation’s 150 dairy processing plants (all small facilities akin to U.S. factories 50-60 years ago) are in operational shape. The food distribution system is highly regulated. Every citizen gets a monthly ration book. The Cuban government buys products sold in ration stores, but budgetary restraints mean store shelves aren’t always well stocked. The measures taken so far amount to a loosening of restrictions, but companies looking to do business in Cuba still must abide by various limitations and jump through bureaucratic hoops. To fully open the market, Congress must officially remove the embargo—an effort some Senators and Representatives are pursuing. 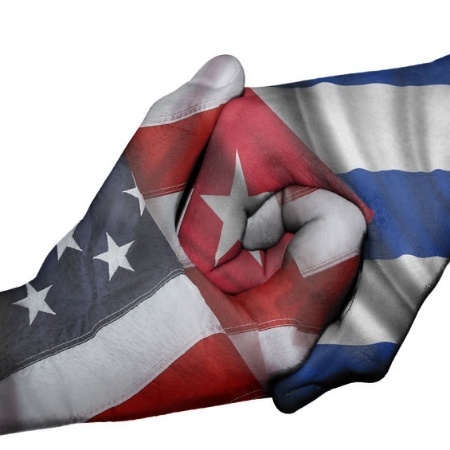 There is strong and growing bipartisan interest in beginning the process to address the issues that are stifling development of the Cuban market. Organizations like USDEC and the USACC are backing such efforts. Business support is broad based and growing. It won’t happen overnight, but it is encouraging to see the level of work from so many corners aimed at pushing forward at this stage. Meanwhile, U.S. suppliers interested in the market can approach it in two ways. The first is more immediate and revolves around tourism. When the market opens to U.S. tourists, a development expected in a matter of months, demand for cheese, yogurt and milk, particularly at hotels, will quickly rise beyond Cuban capacity to manufacture. The second opportunity is longer term and involves assessing a number of questions, including: Are you willing to identify and work with a buyer, invest in Cuba’s infrastructure, provide supply chain assistance and offer technical training? The Cuban opportunity is business development from the ground up. The country is trying to position itself to be ready for the opportunity when the United States ends its embargo. U.S. dairy suppliers willing to ride out transitioning U.S.-Cuba relations and Cuban economic evolution would be wise to do the same. The U.S. Dairy Export Council fosters collaborative industry partnerships with processors, trading companies and others to enhance global demand for U.S. dairy products and ingredients. USDEC is primarily supported by Dairy Management Inc.through the dairy farmer checkoff. How to republish this post.